It’s probably obvious by now that I’m a huge sucker for cookbooks. No matter how many I’ve already amassed, I’m always on the lookout for more. Just about every time I’m in a bookstore, I wind up in the cooking section, scoping out the new vegan offerings and taking a huge stack to look through while eating lunch. So of course I was thrilled when I was offered a copy of Jazzy Vegetarian Classics: Vegan Twists on American Family Favovites to review for the blog! Jazzy Vegatarian Classics is a gorgeous full-color hardback book packed with delicious vegan takes on a whole host of familiar dishes. The author, Laura Theodore, provides easy plant-based recipes for every meal as well as snacks, sauces and desserts. A flip through the book’s glossy pages reveals pizza, pasta, muffins, casseroles, meat-free loaves, puddings, cookies and more. Recipe labels make it easy to find offerings without nuts or oil for those who can’t or don’t want to use those ingredients. The book starts out with an overview of vegan pantry staples and cooking basics as well as a beautiful collection of potential menus. Theodore doesn’t just give recipes; she suggests some mellow, jazzy music to go with each themed meal! I have to admit that the first place I went when the book arrived was the muffin section, but it’s neat to see such an original layout complete with mouth-watering pictures. As I always do with a new cookbook, I picked out a few recipes that I wanted to try and got cooking. 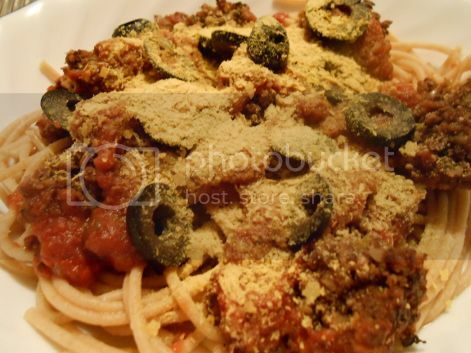 Just about every vegan cookbook ever published has a recipe for spaghetti and some type of meatless “meatball.” I’ve seen them done with tempeh and I’ve seen them done with beans, but I’ve never seen them quite like the mushroom/breadcrumb combination in Theodore’s Spaghetti and Wheatballs. She includes walnuts as well, along with some onion and Italian seasonings, so among vegan meatball recipes, it’s pretty unique! I had trouble getting the mixture to hold together; I don’t think my breadcrumbs were moist enough. Adding a little water helped, and the wheatballs cooked up firmly only to start falling apart again after being added to the sauce later on. Despite that, they smelled deliciously of garlic bread and tasted very much like classic meatballs. I should mention that I absolutely hate meatballs. I have always hated meatballs. Even when I was omni, I couldn’t stand the texture of ground beef in anything, and I continue to dislike vegan foods that mimic the texture. But here, Theodore’s wheatballs manage to mimic meatballs without setting off the mental aversion I have to all things granulated and beefy. I flipped over to the sauce section and made a batch of Dad’s Marinara to go with this. It’s a simple, flavorful, oil-free tomato sauce that reminds me very much of a recipe that my mom and I made for years. I love a long-simmered sauce, even one with a base of canned tomatoes, and this made a thick and tasty topping for the dish. With some sliced black olives and nutritional yeast for garnish, the meal satisfied my staunchly Italian genetics and wasn’t too bad on the taste buds, either! If you’d like to give the dish a try, check out the end of this post for the recipe. Next up was Paella, which is one of those dishes that I’ve been meaning to make for a long time but never got around to. I was intrigued by the picture in this book and decided to finally give it a shot. It smells amazing when it’s cooking and looks equally as amazing when it’s done. In fact, it reminded me uncannily of a Creole-style shrimp dish that I used to make in high school. Turns out that it also tastes uncannily like that dish, but not in a scary fishy way. It’s packed full of veggies, including an entire container of mushrooms. Those were what reminded me of the shrimp–they cook in with the rice, soak up the seasonings and develop a chewy texture reminiscent of seafood. The only thing I wasn’t sure about were the artichoke hearts that get put on top during the last stretch of cooking. The flavor didn’t seem to “go” with the other seasonings, but I’m not sure what would work better. Olives, perhaps? Regardless, this was an amazing, tasty meal that I’d make again in a heartbeat, especially since the only dishes involved are one bowl to mix the ingredients and one pan to cook them! I’ll admit it was odd cooking rice in a skillet and having to resist the urge to stir it, but I loved how all of the flavors came together during the long cooking time. Since I’m already a big fan of chickpea tuna salad, I thought I’d give the Fancy Chickpea Salad a try for lunch one day. Instead of tuna, this recipe is meant to mimic chicken salad. Which, like meatballs, I have never liked. Imagine my pleasant surprise when this simple recipe turned out to be so good that I wound up making it again later the same week (and again for dinner not long after that)! It really didn’t taste like much at first bite, but as I went on with the sandwich, the chunky combination of chickpeas, walnuts and celery started to grow on me. Capers, parsley and cayenne pepper provide most of the flavor, though I felt that it could use even more of the capers and cayenne. I’m also used to chickpea sandwiches having black pepper in them, but it’s not essential to this recipe. Once again, I was impressed by Theodore’s skill at re-creating an omni dish in a way that made it more enjoyable than the original. Three is usually the magic number of “test recipes” I do before writing a review, but I couldn’t resist trying the Deli-Style Macaroni Salad one night as an accompaniment to some Cajun chickpea cakes and garlic-mushroom kale. I remember macaroni salad as a bowl of chilled elbow noodles pretty much glued together with mayonnaise, topped with sliced hard-boiled eggs and sprinkled with paprika. That’s it. And I don’t even want to say how much of that disgusting stuff I mainlined every summer when I was a kid. Theodore’s take on the dish is not only much healthier, but also more exciting for the taste buds. 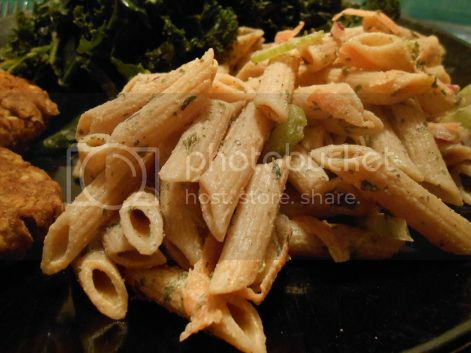 She takes the concept of mayo-soaked macaroni, scales way back on the mayo and adds veggies like grated carrots, sliced celery, and diced onion. To make the dressing more jazzy, she includes some Dijon mustard and maple syrup. My only complaint with the salad as a whole was that I didn’t use enough Dijon and mayo. Other than that, it was pretty darn amazing. The celery added a nice crunch without overwhelming the texture. I’d have no problem mainlining this during the summer, especially along with some homemade vegan burgers. This is just a small sampling of the delightful offerings in Jazzy Vegetarian Classics. To get a taste of it yourself, you can try out the Spaghetti and Wheatballs recipe below, or enter to win a copy of your very own! Put the breadcrumbs, Italian seasoning, garlic powder, and salt in a large bowl. Put the walnuts in a blender and pulse to process into coarse crumbs. 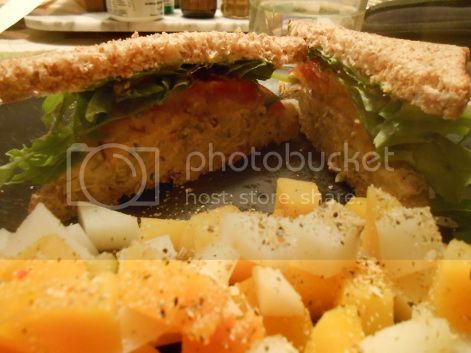 Add the walnuts to the bread crumbs and stir gently to incorporate. Put the mushrooms and onions in a blender and process to a chunky puree. Add the mushroom mixture to the walnut/bread crumb mixture and stir to incorporate. Spoon out about 1 1/2 Tbsp of the mushroom mixture and roll into a ball. Continue in this way with the remaining mushroom mixture. Arrange the rolled wheatballs on the lined baking pan. Bake for 20 to 30 minutes. Gently rotate each wheatball and bake for 12 to 16 minutes more, or until they are crisp and golden. Meanwhile, pour the marinara sauce into a medium sauce pan. Bring the sauce to a simmer over medium-low heat. Gently add the wheatballs to the sauce, one at a time, cover, and simmer for 7 to 10 minutes. To serve, put one-quarter of the spaghetti into each of four pasta bowls, and top with 3 or 4 wheatballs. Ladle marinara sauce over the top and serve immediately. Note: To make fresh bread crumbs, put 3 to 4 slices of whole-grain bread in a blender and process into coarse crumbs. Want to start the new year off with a copy of Jazzy Vegetarian Classics? The folks at BenBella Books have generously offered a copy of this beautiful book to one lucky QV winner. To enter, just leave a comment on this post telling me about your favorite veganized version of a classic omni dish. Deadline extended until Friday, January 3rd! I love the vegan mac and cheese version from Dreena burton’s Let them eat vegan! I love vegan lasagna! Tofu & nutritional yeast make up the “cheese” and eggplant gives it a meaty texture. So good! 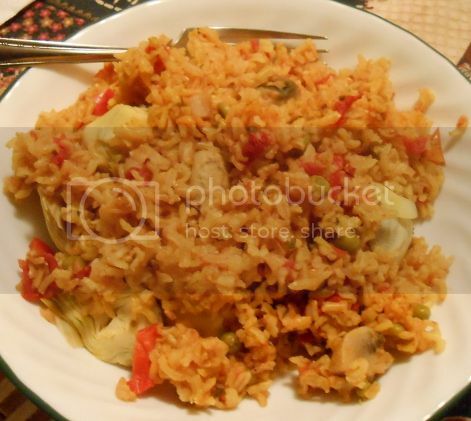 The latest vegan recipe to be sampled and loved is Vegan Brown Rice Jambalaya. I am always trying new veganized recipes that are easy, quick cooking and tastes like it is mainstream American diet. Since I am a fairly recent convert (2 years vegan), and cooking is not a favorite occupation, I lean heavily on those folks who are gifted enough to be able to make the recipe translations from omnivore recipes to vegan recipes and kind enough to share. Vegan pizza loaded with cheddar Daiya, onions, mushrooms, and french fries! I know what you mean about new veg cookbooks — I have so many and yet am always adding to my collection — something new in each one! I like my “bolognese” sauce, also made with lentils, like Simona’s — but I also toss in some spinach and hot sauce to jazz it up. Mmmm. I love vegan fettucine alfredo! Mac & cheese! The first veganized version I learned to make was from Chloe’s Kitchen. After I quit oil/fat, I started using Happy Herbivore’s recipe. Easy, comforting, healthy! boeuf bourguignon…made vegan with porcini and shitakke mushrooms. oh my. its my favorite winter comfort food! !